Dodge Theatre to Learn provides professional learning to classroom teachers with the goal of integrating theatre into the language arts and social studies curriculum. The program begins in second grade, incorporating theatre techniques and dramatic play. Each year the program builds teacher and student mastery of the theatre arts, culminating in fifth grade with the creation and production of an original play. 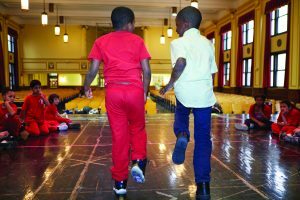 Theatre to Learn, in partnership with the New Jersey Theatre Alliance, is made possible through the generous support of the Geraldine R. Dodge Foundation. For more information on our Dance to Learn and Theatre to Learn programs contact Michelle Marigliano at 866-500-9265 or [email protected].